YELL and SFU Beedie School of Business seek to develop a new model for giving university credit for a program taken in high school. Existing models for giving university credit for high school programs often require the course to be Advanced Placement (AP) or require that classes are taken on campus, which can put them out of reach for some students. SFU Beedie and YELL are committed to ensuring that neither financial resources nor proximity to the university affect a student’s ability to access this opportunity. The model under development is intended to ensure any student who takes the YELL program in BC, regardless of which high school they attend, will be eligible to claim that credit at SFU Beedie. 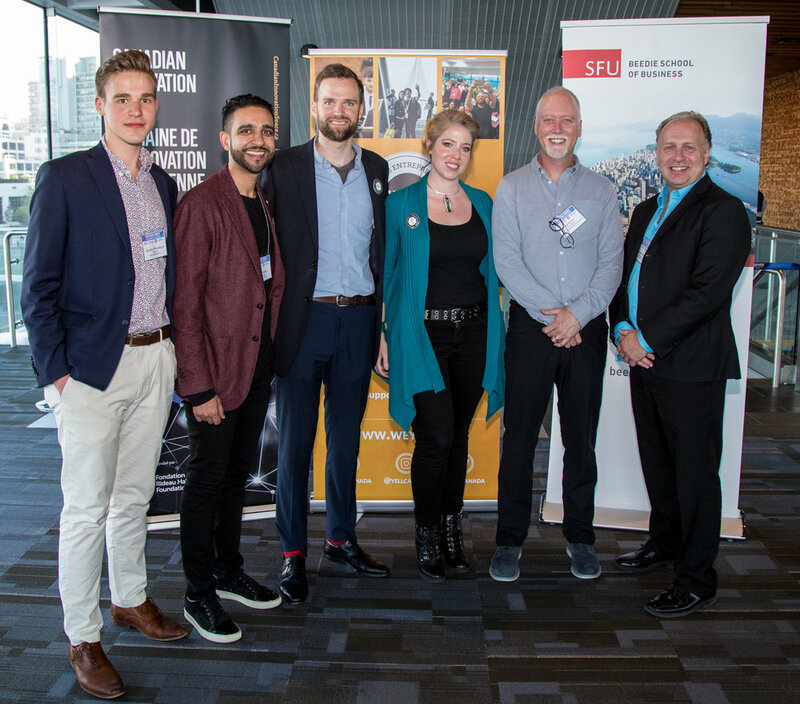 From left to right: Georgiy Sekretaryuk (Youth Ambassador at YELL), Amit Sandhu (Co-Founder of YELL), David Cameron (Executive Director at YELL), Sarah Lubik (Director of Entrepreneurship at SFU), Bill Roche (Co-Founder of PowerPlay Young Entrepreneurs), Andrew Gemino (Associate Dean, Graduate Programs at SFU Beedie). SFU’s Director of Entrepreneurship, Dr. Sarah Lubik, highlights the importance of the entrepreneurial mindset and the people that have them. “Increasingly, it’s hard to predict what technology will enable and what jobs will be available in the future, but what we can predict is fast-paced change, complex problems and the value of the people that can keep up, collaborate, tolerate ambiguity and problem-solve: the entrepreneurs. YELL and Beedie anticipate launching the pilot before the end of 2018, ready for the students who come to SFU in September 2019. What do you get when you mix salmon, high schools students and crickets? 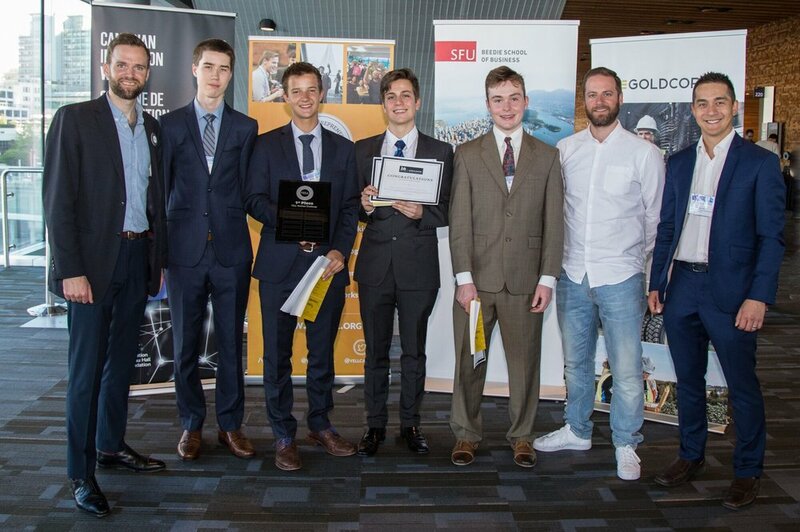 With this in mind Griffin Dent, Teva Zanker, Liam Ryan and Dayne Hack, four high school students from North Vancouver, set themselves on a mission to solve the global food crisis by providing a scalable, environmentally sustainable source of healthy protein: premium cricket-fed Atlantic salmon! This is the concept behind “Prize Catch”, the 2018 Venture Challenge winning venture idea. But why crickets? By growing the cricket used to feed the salmon onsite, Prize Catch is using a more sustainable option then fish meal on its salmon, significantly diminishing the aquaculture impact on the environment and producing a much healthier salmon for consumption. 1. WHAT IS THE NUMBER ONE LESSON YOU WILL TAKE FROM THIS VENTURE CHALLENGE? I think the number one thing is to go beyond what the requirements are! Do all the work necessary to be prepared for questions, as you never know what the judges will throw at you. It’s better to do more work and then cut it down, if needed. This will help you feel more confident in your presentation. Another important point is to never lose sight of your venture goals and mission and keep those in mind when presenting and answering the judge’s questions. 2. HOW HAS THE EXPERIENCE OF HAVING A MENTOR IMPACTED YOU? Our perception of what being a good mentor means has shifted as the program evolved. Initially, we believed that a good mentor is someone that gave you the answers you needed to guide you in the right direction. Although that is to a certain extent still true, we found out that a good mentor knows just how much direction to give and, more importantly, what questions to ask so that you can figure most things out for yourself. Also, having someone that has excelled in business and is willing to share that knowledge with you, like our mentor Kyle Treleaven, gives you an invaluable opportunity for growth. To learn from some of those experiences was very helpful. 3. HOW WOULD YOU DEFINE "ENTREPRENEURIAL MINDSET" AND ITS IMPORTANCE? If we could define it in one word it would be: perseverance. This means never stopping when someone gives you a ‘no’ or things don’t go your way. There is always a better way to do things and if you’re open and persistent, you will get there eventually. It’s also very important to be able to fail, learn from it and keep moving forward. Being comfortable with the concept of failure helps you persevere. Finally, another important point is the openness to learn new concepts and explore new ideas. Sometimes the path to the right solution is not as linear as you would think! 4. WHAT DO YOU FEEL BETTER PREPARED FOR NOW, AFTER TAKING YELL? I think we all feel more prepared for life in general. From a business perspective, YELL has made us more comfortable in front of larger audiences and it feels good to get over that hump! Another critical point was learning about the importance of networking, as well as building connections and collaborating with other people. From a personal perspective, YELL has helped us identify what our strengths are and how to work well in a team. It has also given us tools to develop more confidence to pursue our goals and taught us the power of setting a target: we learned that we can accomplish a lot in a year! Being one of 4 finalists from a pool of 40 competitors teams, is a huge feat! We want to recognize all the hard work and ingenuity of our other 3 finalist teams: SmartPill (close second! ), an automated system that reminds people to take their medication; Cicer, which aids drowsy drivers and those with heart conditions by monitoring their heart rates and sending alerts if any irregularities occur; and Tracker Bond, a GPS tracker that you can stick on valuable items.